Louis Hayward spent the war in the U.S. Marines, and was at Tarawa; afterward he returned to making swashbucklers, but with an edge he hadn’t had before. 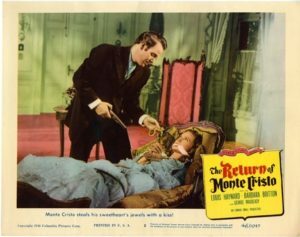 Interestingly, though produced by the same company and with the same star, The Return of Monte Cristo is not a sequel to 1940’s Son of Monte Cristo. The latter, set in 1865, featured the late count’s son (obviously), while Return, which begins in 1868, is about another heir entirely, the count’s grand-nephew. Thus Edward Small, who produced the hit 1934 Count of Monte Cristo, made two alternative and mutually-exclusive sequels to it in the ‘40s. Do their inconsistencies matter? Not at all! The intro to Return features a bogus letter from Alexandre Dumas explaining why he decided to tell this story—which he totally didn’t, but it’s a pretty good Dumas pastiche, crafted in emulation of the original Count of Monte Cristo (1844). When the count’s grand-nephew and heir, also named Edmund Dantés, goes to court to claim his vast inheritance, he’s cheated of it by three corrupt officials, and sentenced, under a false name, to life imprisonment on Devil’s Island. The French tropical penal colony is even worse than the Château d’If (which will make an appearance in act two), and there’s no Abbé Faria to help him, so this Edmund Dantés is on his own. Spoiler: he manages to escape, and returns to France to commence his campaign of revenge. With the help of a master actor, who escaped Devil’s Island with him, Dantés, to fool and entrap his prey, begins assuming various guises, such as a bank auditor, an Imperial nobleman, and a hunchbacked private investigator. To give Hayward his due, these impersonations are pretty entertaining, but they can’t quite carry the film, which is fairly pedestrian otherwise. The Return of Monte Cristo is a darker film than Son, or even Count, almost a historical film noir in feel. In fact, it’s probably the least swashbuckling Monte Cristo film of all its many adaptations and sequels. That said, its emphasis on vengeance certainly fits more thematically than the Zenda-esque Son of Monte Cristo, though that film was a lot more fun—and it had a top-notch villain in George Sanders, something this movie lacks. In short, though Louis Hayward does his best, this isn’t a very successful film.